I have the 1996 Terrorvision song “Perseverance” playing in my head today: “Whales and dolphins, whales and dolphins, yeah.” Why? Because I discovered something shocking about my beloved Japan today. I’ve always known that some strange things are on the menu in Japan and, being a pescetarian (that’s a veggie who eats fish, by the way), I’ve always felt a little queasy about eating most kinds of meat (even cows and pigs). I confess that I did eat chicken for most of my time in Nagoya, but for some reason I couldn’t stomach it once I got to Hamamatsu and I quit eating it again. Other than chicken (and anything that snuck into my food without my knowing it), I haven’t eaten meat properly since around the time I became a teenager. I don’t really mind other people eating meat though, so long as they can admit to themselves what they are eating. 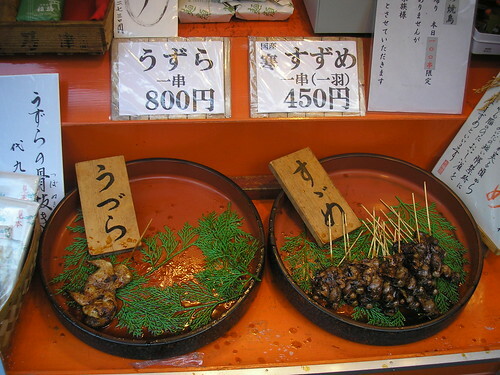 …basashi (ばさし) (raw horse meat), ikizukuri (いきずくり) (live fish) and, of course, whale. However, today I heard about another item on the menu which was far more shocking than any of the above. At first, I thought there must have been some miscommunication and that the person who told me about eating dolphins actually meant whales. But no. Dolphins. いるか. Dolphins. My response was to simple repeat the word. Dolphins? Dolphins?? Dolphins??? I felt so shocked I actually could have burst into tears right there and then. I couldn’t believe that anyone would eat dolphins – an animal usually considered to be very intelligent. If you don’t believe me, check out this informative blog post: What it’s like to eat Flipper. See? People really do eat dolphin meat in Japan. I’m curious to see the documentary film The Cove, now. I hadn’t heard about it before, but it’s been mentioned to me every time I’ve squeaked “dolphins? ?” at someone today. When I travel, I’ve always been amazed at what different cultures eat. More importantly how they even thought to prepare it that way. Good luck on the Post a Week goal for the year. Actually, in a shocking documentary I saw that a lot of the whale meat on sale in Japan is actually dolphin meat. Especially canned whale is often really dolphin. Apparently they do that because dolphin meat is easier to get and if they pretend it’s whale they can get a lot more money for it, and the meat is supposed to be similar. And the way they kill dolphins is horrible. If you watch The Cove, be prepared to see your friends the dolphins viewed as food or as a marketable resource. What you probably aren’t prepared for is that the Japanese do not consider they are doing anything is wrong. It is true that it really is the older people who have acquired a taste for whale because of the war. What’s worse is that there is 6,000 tons of whalemeat that has been on ice in Japan. It is now being turned into flavored hot dogs and hamburgers. Yesterday Hankyu Hashin started their annual whale meat sale, even promoting that the meat was purchased from the Japanese Whaling Research Institute, under the guise of “research”. It is done straight in the face of the world, just like the dolphins that are killed in The Cove. And after The Cove was aired, the Japanese have put up barriers so no one can see the carnage. The point is, if they wouldn’t try to be hiding their actions if they really thought what they were doing was right. Thanks for bringing that to our attention Ali, I didnt realise either that dolphins were on the menu in Japan, I have asked my Japanese friends about the whale meat thats eaten in Japan and most dont understand what all the fuss is about from western people, but at the same time they are horrified that we can cook and eat a whole chicken as opposed to chicken ‘pieces’ from the supermarket. How can one culture judge another (either way) .. its a perplexing problem! Thanks for stopping by, Andy! Really? I’m surprised to hear that some of your friends were horrified about cooking a whole chicken. Except for the size of it, of course! You’re right though – perhaps I shouldn’t judge. But… I can’t help thinking “eeew” and “poor intelligent dolphins!”. Thanks for the comment on the site, too. I had a quick peep at your photography and it looks wonderful! yeah me too, I was surprised when I was told that … I couldnt see the difference between pieces and a whole chicken … its still the same poor ol’ chook! Thanks for the site comment Ali, most photos are from a few years ago when I was taking photos with a pocket camera (except Japan ones), I have recently become more photography serious and will visit Japan this Sakura for a month to hopefully improve my photography skill and take better photos for my site! Everyone could always just stop eating animals altogether. Than no one would be horrified by different cultures’ beliefs on what animal(and their parts) are acceptable to eat….